One of the things we love about Matcha is its versatility. 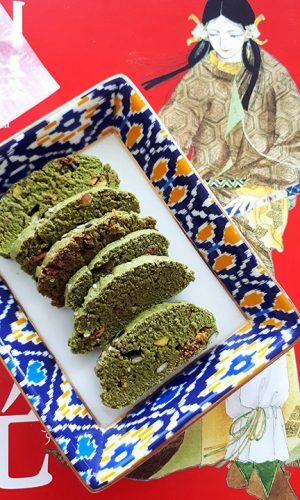 You can drink it (from hot beverage to cocktails), bake with it (from cakes to cookies), make ice cream or create your own savory Matcha salt. So, we’re mixing Matcha with one of our favorite Italian biscuits, Biscotti (or “Cantuccini” in this case). An interesting fact about Biscotti, meaning “baked twice,” is that historically they were staple food during the long journey and wars in the Roman legions, given that they’re very dry and could be stored for a long period of time. Our Italian side of the family typically serves them as an after-dinner dessert with wine, called vin santo. Being Asian, they’d probably kill me if they knew that I like mine with a cappuccino in the morning, and snack on them in the afternoon. Making biscotti is actually quite easy and the dough is very forgiving. We find this to be a great addition to your holiday cookie tray. They also make as wonderful homemade gifts. Here, we’re adding our three (3) favorite ingredients: superfood Matcha, pistachio & figs! This recipe has reduced sugar and is dairy free. Pre-heat oven to 375F (190C) and set aside cookie sheets with parchment paper. In a medium bowl, combine the flour, sugar, Matcha, baking powder and salt. In another bowl, mix together the olive oil, eggs and almond extract. Then, add the flour mixture in a few batches. The dough will be sticky, heavy and moist. Add the pistachio & dried figs. Knead gently for about 5 or 6 times to ensure all ingredients are mixed together. Roll the dough and shape into a log and divide into 2 pieces with a slightly flattened top. You can make them as wide or narrow as you like. Sprinkle with sesame seeds & flax seeds. Place the dough on the parchment paper and bake for about 30 minutes, until light brown. Be careful not to burn the top of the biscotti. Remove and let cool for 15 mins. When cooled, use a serrated knife to cut the biscotti diagonally at ½ inches /1.3cm or ¾ inches /2cm diagonally. We like ours on the thin side. Place the sliced biscotti on the baking sheet and bake for another 15-20 mins each side. You can also add more sugar if desired and use Almonds or Hazelnuts as a substitute. Biscotti will last for several weeks. It is best to keep them in an airtight container.